A few days ago we listed some of the best office apps for Android. If, in case, you’ve buried your head a tad too much into those spreadsheets and presentations, there’s no better way to unwind than by watching a nice movie. Thanks to some great advancements in technology, you no longer have to pop in your DVDs every time you want to catch a movie; cellphones like iPhone and Android offer a great movie viewing experience especially while you’re on the go. However, if, like the great David Lynch, watching movies on a cellphone is not your thing, then treat yourself with the latest funny videos on YouTube. If you own an Android device be it a tablet computer or a smartphone, read on as we suggest to you some great apps that will let you do all the aforementioned things and more. 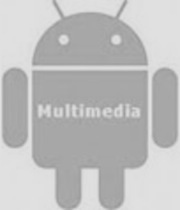 So, without further ado, here are 5 amazing multimedia applications for Android. Have a movie sitting on your computer? Want to watch it on your droid without going through the hassles of conversions, decoding and encoding? 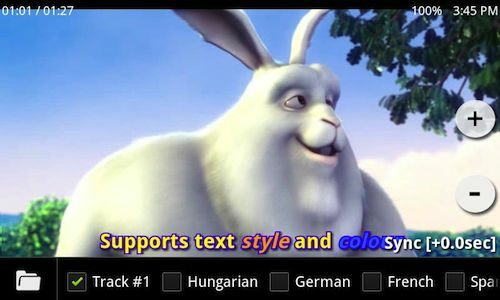 Don’t worry; MX Video player is here to help you. MX Video Player is a great multimedia player for Android that plays almost any kind of video file. With powerful features like Multi-core decoding and CPU optimize, MX Video Player plays all your video files without any lag whatsoever. Also, for folks who love foreign films, MX renders subtitles with crystal clear quality. Another unique feature about this application is the multi-touch video zoom functionality that lets you zoom in on any video by simply using your two fingers. If you happen to own a nice Android tablet, MX video player also runs on Honeycomb. With a 4.6 rating in the Android Marketplace, the application is immensely popular. MX Video Player is free (ad-supported). Have a lot of mp3 files sitting around on your Droid? Play around with them using the Ringtone Maker app. Ringtone Maker lets you create interesting ringtones from your music files. To get started, just fire up the app, snip the portion you need, save it and use it as a ringtone. One problem with many custom ringtones is that the volume is a bit lower than you expect it to be. With Ringtone maker, that problem is easily taken care of with the volume adjust feature that’s built in to the app. 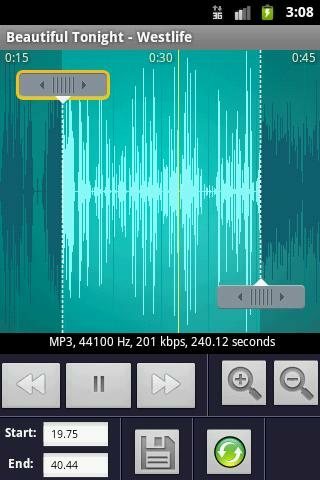 Snipping the audio files is done using the easy to use multi touch interface making the process as hassle free as possible. Supported formats are Mp3, Wav, AAC and 3GP. 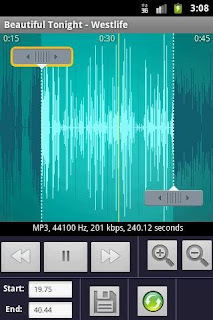 Ringtone Maker is free and available to download from the Android marketplace. The aforementioned MX Video player makes things easier by getting rid of steps like conversion and encoding. But VLC Direct goes one step further by bringing 2-way direct streaming to your cellphone. Yes, this means not only can you stream videos from your computer to your device; you can also stream videos to your computer from the cellphone. Cool huh? This requires no special setup as it makes use of one the most feature-loaded and powerful multimedia applications out there, that’s VLC. Apart from streaming videos, VLC direct can also stream photos and music files in both directions. To make this work, all you need to do is enable VLC Web interface on your VLC desktop application. 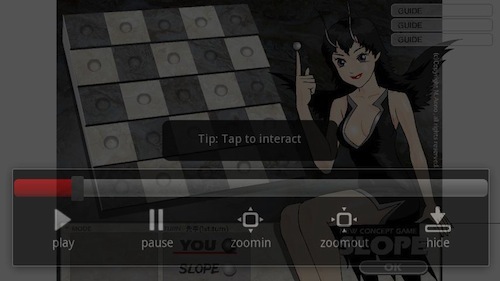 You can then browse and play media right from your device. There are two versions of this application, one is the free version, which you can use right away, but the playback is limited to just a few minutes per file, and that too with subtitles feature disabled. The other version is the paid one, that is VLC Direct Pro, which will let you use the application without any limitations whatsoever. Rated 4.0 stars in the Android Marketplace, VLC Direct has more than 500k downloads so far. Remember those little flash animations and games from the early days of the Internet? As annoying and old school as they are now, they were actually quite popular a few years back. People even used to download those little SWF games and play them for hours. I bet some of them must still be having them stored somewhere on their computer. In case you have, then why not move them over to your smartphones and enjoy them on the go? Smart SWF player lets you do exactly that by letting you play flash animations, games and apps on your Android devices. You can view the SWF files in landscape or portrait mode, with easy to access play controls. And yes, you can play flash games in full screen too. With 4.3 rating in the Android Marketplace, Smart SWF Player is free to download. You just shot a video of your friend’s birthday and now you want to upload it to YouTube. Also, you don’t want to go through the hassles of transferring the video to the computer, then editing it, and then uploading it. You just want the whole thing to be done using your ‘smart’ phone. But wait, you can’t upload it just yet, not with that 45 minute long scene of your friends talking ceaselessly amongst themselves. Somehow you wish you could edit those bits out instantly and upload the best parts of the party, which are about 10 minutes long; perfect for YouTube apparently. If you have an Android smartphone, it’s your lucky day as this next app lets you edit videos from your phone, then save them, and then upload them to YouTube without even touching your computer. 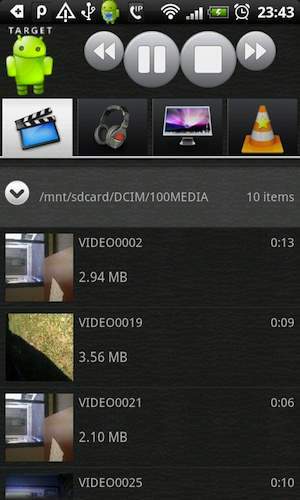 VidTrim is a fully featured video editor for Android that lets you edit your videos on the go. You can either trim the original clip or save it as a new clip. I’d suggest you use the latter option, as it is always a good idea to have the raw footage intact. Once you’re done editing, you can save those clips and share them with your buddies by email. You can also upload the video to YouTube right from the app, making it a great app for video bloggers. There are 2 versions of the app, one is free and other is the pro version. The free version will let you edit all your videos without any limitations, but the pro version gives you extra options like transcoding and compression.